Spreading manure, an organic fertilizer. Fertilizers (also spelled fertilisers) are compounds given to plants to promote growth; they are usually applied either via the soil, for uptake by plant roots, or by foliar feeding, for uptake through leaves. Fertilizers can be organic (composed of organic matter), or inorganic (made of simple, inorganic chemicals or minerals). They can be naturally occurring compounds such as peat or mineral deposits, or manufactured through natural processes (such as composting) or chemical processes (such as the Haber process). Fertilizers typically provide, in varying proportions, the three major plant nutrients (nitrogen, phosphorus, and potassium), the secondary plant nutrients (calcium, sulfur, magnesium), and sometimes trace elements (or micronutrients) with a role in plant nutrition: boron, chlorine, manganese, iron, zinc, copper, and molybdenum. In the past, both organic and inorganic fertilizers were called "manures," but this term is now mostly restricted to man-made manure. Though nitrogen is plentiful in the Earth's atmosphere, relatively few plants engage in nitrogen fixation (conversion of atmospheric nitrogen to a biologically useful form). Most plants thus require nitrogen compounds to be present in the soil in which they grow. While manure, cinder and ironmaking slag has been used to improve crops for centuries, the fertilizers were arguably one of the great innovations of the Agricultural Revolution of the nineteenth century. Chemist Justus von Liebig contributed greatly to the advancement in the understanding of plant nutrition. His influential works first denounced the vitalist theory of humus, arguing first the importance of ammonia, and later the importance of inorganic minerals. Primarily his work succeeded in setting out questions for agricultural science to address over the next 50 years. In England he attempted to implement his theories commercially through a fertilizer created by treating phosphate of lime in bone meal with sulphuric acid. Although it was much less expensive than the guano that was used at the time, it failed because it was not able to be properly absorbed by crops. At that time in England Sir John Bennet Lawes was experimenting with crops and manures at his farm at Harpenden and was able to produce a practical superphosphate in 1842 from the phosphates in rock and coprolites, which are the fossilized excrement of dinosaurs. Encouraged, he employed Sir Joseph Henry Gilbert, who had studied under Liebig at the University of Giessen, as director of research. To this day, the Rothamsted research station that they founded still investigates the impact of inorganic and organic fertilizers on crop yields. In France, Jean Baptiste Boussingault pointed out that the amount of nitrogen in various kinds of fertilizers is important. Metallurgists Percy Gilchrist and Sidney Gilchrist Thomas invented the Thomas-Gilchrist converter, which enabled the use of high phosphorus acidic Continental ores on steelmaking. The dolomite lime lining of the converter turned in time into calcium phosphate, which could be used as fertilizer known as Thomas-phosphate. In the early decades of the twentieth century the Nobel prize-winning chemists Carl Bosch of IG Farben and Fritz Haber developed the process that enabled nitrogen to be cheaply synthesised into ammonia, for subsequent oxidization into nitrates and nitrites. The Englishmen James Fison, Edward Packard, Thomas Hadfield and the Prentice brothers each founded companies in the early nineteenth century to create fertilizers from bonemeal. The developing sciences of chemistry and Paleontology, combined with the discovery of coprolites in commercial quantities in East Anglia, led Fisons and Packard to develop sulfuric acid and fertilizer plants at Bramford, and Snape, Suffolk in the 1850s to create superphosphates, which were shipped around the world from the port at Ipswich. By 1870 there were about 80 factories making superphosphate. After World War I these businesses came under financial pressure through new competition from guano, primarily found on the Pacific Islands, as their extraction and distribution had become economically attractive. The interwar period saw innovative competition from Imperial Chemical Industries who developed synthetic ammonium sulfate in 1923, Nitro-chalk in 1927, and a more concentrated and economical fertilizer called CCF based on ammonium phosphate in 1931. Competition was limited as ICI ensured it controlled most of the world's ammonium sulfate supplies. Other European and North American fertilizer companies developed their market share, forcing the English pioneer companies to merge, becoming Fisons, Packard, and Prentice Ltd. in 1929. Together they were producing 80,000 metric tons of superphosphate per annum by 1934 from their new factory and deep-water docks in Ipswich. By World War II they had acquired about 40 companies, including Hadfields in 1935, and two years later the large Anglo-Continental Guano Works, founded in 1917. The post-war environment was characterized by much higher production levels as a result of the "Green Revolution" and new types of seed with increased nitrogen-absorbing potential, notably the high-response varieties of maize, wheat, and rice. This has accompanied the development of strong national competition, accusations of cartels and supply monopolies, and ultimately another wave of mergers and acquisitions. The original names no longer exist other than as holding companies or brand names: Fisons and ICI agrochemicals are part of today's Yara International and AstraZeneca companies. Soil Fertilization or Crop Fertilization are methods of improving soil quality with a view towards improving soil fertility. Fertilization improves crop yield and provides additional income and profit for farmers. Plants need various elements in order to grow and people have known for hundreds of years of the need to improve the quality of the soil. Slash and burn agricultural methods added ash to the soil for temporary benefit, but every few years it was necessary to move to new locations. Early Celts added seaweed to enhance thin soils, and oyster shells were found to improve crops. Ancient methods varied from the Native American practice of placing fish in a hill of maize and adding rock phosphate to the surface to improve production. As science and understanding has advanced soil testing has become possible as well as methods to improve the soil based on the results of those tests. Nitrogen is the element in the soil that is most often lacking. Phosphorous and potassium are also needed in substantial amounts. For this reason these three elements are included in commercial fertilizers and the content of each of these items is included on the bags of fertilizer. For example a 10-10-15 fertilizer has 10 percent nitrogen, 10 percent phosphorous and 15 percent potassium. Inorganic fertilizers are generally less expensive and have higher concentrations of nutrients than organic fertilizers. It is believed that organic agricultural methods are more environmentally friendly and better maintain soil organic matter levels. There are generally accepted scientific studies that support this supposition. Regardless the source, fertilization results in increased unharvested plant biomass left on the soil surface and crop residues remaining in the soil. Too much of a vital nutrient can be as detrimental as not enough. Fertilizer burn can occur when too much fertilizer is applied, resulting in a drying out of the roots and damage or even death of the plant. Organic fertilizers are just as likely to burn as inorganic fertilizers. If excess nitrogen is present the plants will begin to exude nitrogen from the leafy areas. This is called guttation. Example of naturally occurring inorganic fertilizers include Chilean sodium nitrate, mined "rock phosphate," and limestone (a calcium source). Fertilizers can be divided into macronutrients or micronutrients based on their concentrations in plant dry matter. There are six macronutrients: nitrogen, phosphorus, and potassium, often termed "primary macronutrients" because their availability is usually managed with NPK fertilizers, and the "secondary macronutrients" — calcium, magnesium, and sulfur — which are required in roughly similar quantities but whose availability is often managed as part of liming and manuring practices rather than fertilizers. The macronutrients are consumed in larger quantities and normally present as a whole number or tenths of percentages in plant tissues (on a dry matter weight basis). There are many micronutrients, required in concentrations ranging from 5 to 100 parts per million (ppm) by mass. Plant micronutrients include iron (Fe), manganese (Mn), boron (B), copper (Cu), molybdenum (Mo), nickel (Ni), chlorine (Cl), and zinc (Zn). Synthesized materials are also called artificial, and may be described as straight, where the product predominantly contains the three primary ingredients of nitrogen (N), phosphorus (P), and potassium (K), which are known as N-P-K fertilizers or compound fertilizers when elements are mixed intentionally. They are named or labeled according to the content of these three elements, which are macronutrients. The mass fraction (percent) nitrogen is reported directly. However, phosphorus is reported as phosphorus pentoxide (P2O5), the anhydride of phosphoric acid, and potassium is reported as potash or potassium oxide (K2O), which is the anhydride of potassium hydroxide. Fertilizer composition is expressed in this fashion for historical reasons in the way it was analyzed (conversion to ash for P and K); this practice dates back to Justus von Liebig (see more below). Consequently, an 18-51-20 fertilizer would have 18 percent nitrogen as N, 51 percent phosphorus as P2O5, and 20 percent potassium as K2O, The other 11 percent is known as ballast and may or may not be valuable to the plants, depending on what is used as ballast. Although analyses are no longer carried out by ashing first, the naming convention remains. If nitrogen is the main element, they are often described as nitrogen fertilizers. An 18−51−20 fertilizer therefore contains, by weight, 18 percent elemental nitrogen (N), 22 percent elemental phosphorus (P) and 16 percent elemental potassium (K). In general, agricultural fertilizers contain only one or two macronutrients. Agricultural fertilizers are intended to be applied infrequently and normally prior to or along side seeding. Examples of agricultural fertilizers are granular triple superphosphate, potassium chloride, urea, and anhydrous ammonia. The commodity nature of fertilizer, combined with the high cost of shipping, leads to use of locally available materials or those from the closest/cheapest source, which may vary with factors affecting transportation by rail, ship, or truck. In other words, a particular nitrogen source may be very popular in one part of the country while another is very popular in another geographic region only due to factors unrelated to agronomic concerns. Horticultural or specialty fertilizers, on the other hand, are formulated from many of the same compounds and some others to produce well-balanced fertilizers that also contain micronutrients. Some materials, such as ammonium nitrate, are used minimally in large scale production farming. The 18-51-20 example above is a horticultural fertilizer formulated with high phosphorus to promote bloom development in ornamental flowers. Horticultural fertilizers may be water-soluble (instant release) or relatively insoluble (controlled release). Controlled release fertilizers are also referred to as sustained release or timed release. Many controlled release fertilizers are intended to be applied approximately every 3-6 months, depending on watering, growth rates, and other conditions, whereas water-soluble fertilizers must be applied at least every 1-2 weeks and can be applied as often as every watering if sufficiently dilute. Unlike agricultural fertilizers, horticultural fertilizers are marketed directly to consumers and become part of retail product distribution lines. Nitrogen fertilizer is often synthesized using the Haber-Bosch process, which produces ammonia. This ammonia is applied directly to the soil or used to produce other compounds, notably ammonium nitrate and urea, both dry, concentrated products that may be used as fertilizer materials or mixed with water to form a concentrated liquid nitrogen fertilizer, UAN. Ammonia can also be used in the Odda Process in combination with rock phosphate and potassium fertilizer to produce compound fertilizers such as 10-10-10 or 15-15-15. The production of ammonia currently consumes about 5 percent of global natural gas consumption, which is somewhat under 2 percent of world energy production. Natural gas is overwhelmingly used for the production of ammonia, but other energy sources, together with a hydrogen source, can be used for the production of nitrogen compounds suitable for fertilizers. The cost of natural gas makes up about 90% of the cost of producing ammonia. The price increases in natural gas in the past decade, among other factors such as increasing demand, have contributed to an increase in fertilizer price. Nitrogen-based fertilizers are most commonly used to treat fields used for growing maize, followed by barley, sorghum, rapeseed, soyabean and sunflower. Inorganic fertilizers sometimes do not replace trace mineral elements in the soil which become gradually depleted by crops grown there. This has been linked to studies which have shown a marked fall (up to 75 percent) in the quantities of such minerals present in fruit and vegetables. One exception to this is in Western Australia where deficiencies of zinc, copper, manganese, iron and molybdenum were identified as limiting the growth of crops and pastures in the 1940s and 1950s. Soils in Western Australia are very old, highly weathered and deficient in many of the major nutrients and trace elements. Since this time these trace elements are routinely added to inorganic fertilizers used in agriculture in this state. In many countries there is the public perception that inorganic fertilizers "poison the soil" and result in "low quality" produce. However, there is very little (if any) scientific evidence to support these views. When used appropriately, inorganic fertilizers enhance plant growth, the accumulation of organic matter and the biological activity of the soil, while reducing the risk of water run-off, overgrazing and soil erosion. The nutritional value of plants for human and animal consumption is typically improved when inorganic fertilizers are used appropriately. Examples of naturally occurring organic fertilizers include manure, slurry, worm castings, peat, seaweed, sewage , and guano. Green manure crops including legumes like clovers and vetches are also grown to add nutrients to the soil. Summer plantings can be millet, forage sorghum, or buckwheat. . Naturally occurring minerals such as mine rock phosphate, sulfate of potash and limestone are also considered Organic Fertilizers. Examples of manufactured organic fertilizers include compost, bloodmeal, bone meal and seaweed extracts. Other examples are natural enzyme digested proteins, fish meal, and feather meal. The decomposing crop residue from prior years is another source of fertility. Though not strictly considered "fertilizer," the distinction seems more a matter of words than reality. Some ambiguity in the usage of the term 'organic' exists because some of synthetic fertilizers, such as urea and urea formaldehyde, are fully organic in the sense of organic chemistry. In fact, it would be difficult to chemically distinguish between urea of biological origin and that produced synthetically. On the other hand, some fertilizer materials commonly approved for organic agriculture, such as powdered limestone, mined "rock phosphate" and Chilean saltpeter, are inorganic in the use of the term by chemistry. Although the density of nutrients in organic material is comparatively modest, they have some advantages. For one thing organic growers typically produce some or all of their fertilizer on-site, thus lowering operating costs considerably. Then there is the matter of how effective they are at promoting plant growth, chemical soil test results aside. The answers are encouraging. Since the majority of nitrogen supplying organic fertilizers contain insoluble nitrogen and are slow release fertilizers their effectiveness can be greater than conventional nitrogen fertilizers. the progressive decrease of real or perceived "soil health," apparent in loss of structure, reduced ability to absorb precipitation, lightening of soil color, etc. As acknowledged above, they are typically a dilute source of nutrients compared to inorganic fertilizers, and where significant amounts of nutrients are required for profitable yields, very large amounts of organic fertilizers must be applied. This results in prohibitive transportation and application costs, especially where the agriculture is practiced a long distance from the source of the organic fertilizer. The composition of organic fertilizers tends to be highly variable, so that accurate application of nutrients to match plant production is difficult. Hence, large-scale agriculture tends to rely on inorganic fertilizers while organic fertilizers are cost-effective on small-scale horticultural or domestic gardens. Improperly-processed organic fertilizers may contain pathogens harmful to humans or plants. Organic fertilizers are derived from natural sources, which may include animal feces or plant/animal matter contaminated with pathogens. 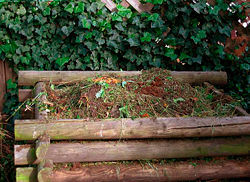 However, proper composting of raw materials used in organic fertilizers will kill pathogens. In practice a compromise between the use of artificial and organic fertilizers is common, typically by using inorganic fertilizers supplemented with the application of organics that are readily available such as the return of crop residues or the application of manure. It is important to differentiate between what we mean by organic fertilizers and fertilizers approved for use in organic farming and organic gardening by organizations and authorities who provide organic certification services. Some approved fertilizers may be inorganic, naturally occurring chemical compounds, e.g., minerals. The problem of over-fertilization is primarily associated with the use of artificial fertilizers, because of the massive quantities applied and the destructive nature of chemical fertilizers on soil nutrient holding structures. The high solubilities of chemical fertilizers also exacerbate their tendency to degrade ecosystems. Storage and application of some nitrogen fertilizers in some weather or soil conditions can cause emissions of the greenhouse gas nitrous oxide (N2O). Ammonia gas (NH3) may be emitted following application of inorganic fertilizers, or manure or slurry. Besides supplying nitrogen, ammonia can also increase soil acidity (lower pH, or "souring"). Excessive nitrogen fertilizer applications can also lead to pest problems by increasing the birth rate, longevity and overall fitness of certain pests. The concentration of up to 100 mg/kg of Cadmium in phosphate minerals (for example, minerals from Nauru and the Christmas islands) increases the contamination of soil with Cadmium, for example in New Zealand. Uranium is another example of a contaminant often found in phosphate fertilizers. For these reasons, it is recommended that knowledge of the nutrient content of the soil and nutrient requirements of the crop are carefully balanced with application of nutrients in inorganic fertilizer especially. This process is called nutrient budgeting. By careful monitoring of soil conditions, farmers can avoid wasting expensive fertilizers, and also avoid the potential costs of cleaning up any pollution created as a byproduct of their farming. It is also possible to over-apply organic fertilizers; however, their nutrient content, their solubility, and their release rates are typically much lower than chemical fertilizers. By their nature, most organic fertilizers also provide increased physical and biological storage mechanisms to soils, which tend to mitigate their risks. The growth of the world's population to its current figure has only been possible through intensification of agriculture associated with the use of fertilizers. There is an impact on the sustainable consumption of other global resources as a consequence. fertilizers that use nitric acid or ammonium bicarbonate, the production and application of which results in emissions of nitrogen oxides, nitrous oxide, ammonia and carbon dioxide into the atmosphere. By changing processes and procedures it is possible to mitigate some, but not all, of these effects on anthropogenic climate change known as global warming. ↑ Haber & Bosch Most influential persons of the 20th century. Retrieved September 6, 2007. ↑ History of Fisons at Yara.com. Retrieved September 6, 2007. ↑ Competition Commission report. Retrieved September 6, 2007. ↑ History of Yara at Yara.com. Retrieved September 6, 2007. ↑ Crop Fertilization Improves Soil Quality. IPNI. Retrieved September 6, 2007. ↑ Harris, Glen and Shelby Baker Nitrogen Fertilization. Retrieved September 6, 2007. ↑ R.C. Harris, 2005. Avoiding Fertilizer Burn. Retrieved September 6, 2007. ↑ UK Fertilisers Regulations 1990, Schedule 2 Part 1, Para. 7. Retrieved September 6, 2007. ↑ Food and Agricultural Organization of the U.N. Table 3.3. Retrieved September 6, 2007. ↑ IFA - Statistics - Fertilizer Indicators - Details - Raw material reserves. Retrieved September 6, 2007. ↑ Sawyer J.E. 2001. Natural gas prices affect nitrogen fertilizer costs. IC-486. 1:8. Retrieved September 6, 2007. ↑ Felicity Lawrence. 2004. Not on the Label. (New York, NY: Penguin. ISBN 0141015667). ↑ Brad Lemley, 2006. Anything Into Oil. Discover Magazine. Retrieved September 6, 2007. ↑ Lemley, 2003. Anything Into Oil. Discover Magazine. Retrieved September 6, 2007. ↑ Preston Sullivan. Overview of Cover Crops and Green Manures: Fundamentals of Sustainable Agriculture . National Sustainable Agriculture Information Service. Retrieved May 18, 2008. ↑ ciwmb.ca.gov - organics document. Retrieved September 6, 2007. ↑ G.C. Jahn, 2004. Effect of soil nutrients on the growth, survival and fecundity of insect pests of rice: an overview and a theory of pest outbreaks with consideration of research approaches. Multitrophic interactions in Soil and Integrated Control. International Organization for Biological Control (IOBC) wprs Bulletin 27(1): 115-122. ↑ G.C. Jahn, E.R. Sanchez, P.G. Cox. 2001. The quest for connections: developing a research agenda for integrated pest and nutrient management. International Rice Research Institute - Discussion Paper 42: 18. Retrieved September 6, 2007. ↑ G.C. Jahn, P.G. Cox, E. Rubia-Sanchez, M. Cohen. 2001. The quest for connections: developing a research agenda for integrated pest and nutrient management. S. Peng and B. Hardy [eds.] "Rice Research for Food Security and Poverty Alleviation." Proceeding the International Rice Research Conference, 31 March – 3 April 2000, Los Baños, Philippines. Los Baños (Philippines): International Rice Research Institute. ↑ Jahn G.C., L.P. Almazan, J. Pacia. 2005. Effect of nitrogen fertilizer on the intrinsic rate of increase of the rusty plum aphid, Hysteroneura setariae (Thomas) (Homoptera: Aphididae) on rice (Oryza sativa L.). Environmental Entomology. 34:4:938-943. Retrieved September 6, 2007. ↑ Preap V., M.P. Zalucki, H.J. Nesbitt, G.C. Jahn. 2001. Effect of fertilizer, pesticide treatment, and plant variety on realized fecundity and survival rates of Nilaparvata lugens (Stål); Generating Outbreaks in Cambodia. Journal of Asia Pacific Entomology. 4:1:75-84. ↑ Preap V., M.P. Zalucki, G.C. Jahn. 2002. Effect of nitrogen fertilizer and host plant variety on fecundity and early instar survival of Nilaparvata lugens (Stål): immediate response. Proceedings of the 4th International Workshop on Inter-Country Forecasting System and Management for Planthopper in East Asia. 13-15 November 2002. Guilin China. Published by Rural Development Administration (RDA) and the Food and Agriculture Organization (FAO). ↑ J.K. Syers, A.D. Mackay, M.W. Brown, C.D. Currie. 1986. Chemical and physical characteristics of phosphate rock materials of varying reactivity. J Sci Food Agric 37: 1057-1064. ↑ N.A. Trueman. 1965. The phosphate, volcanic and carbonate rocks of Christmas Island (Indian Ocean). J Geol Soc Aust 12: 261-286. ↑ M.D. Taylor. 1997. Accumulation of Cadmium derived from fertilisers in New Zealand soils. Science of Total Environment 208: 123-126. ↑ E.M. Hussein. 1994. Radioactivity of phosphate ore, superphosphate, and phosphogypsum in Abu-zaabal phosphate. Health Physics 67: 280-282. ↑ D. Barisic, S. Lulic, P. Miletic. 1992. Radium and uranium in phosphate fertilizers and their impact on the radioactivity of waters. Water Research 26: 607-611. ↑ L.C. Scholten, C.W.M. Timmermans. 1992. Natural radioactivity in phosphate fertilizers. Nutrient cycling in agroecosystems 43: 103-107. ↑ Vaclav Smil. 1999. Detonator of the population explosion. Nature 400 (July 1999) available online .Retrieved May 18, 2008. ↑ Haber & Bosch: Most influential persons of the 20th century. Retrieved September 6, 2007. ↑ Food and Agricultural Organization of the U.N. Retrieved September 6, 2007. California Plant Health Association. 2002. Western Fertilizer Handbook. Danville, IL: Interstate Publishers. ISBN 0813432103. The Fertilizer Institute. 2007. About Fertilizer. The Fertilizer Institute. Retrieved September 1, 2007. Havlin, John L., Samuel L. Tisdale, James D. Beaton, and Werner L. Nelson. 2004. Soil Fertility and Fertilizers: An Introduction to Nutrient Management, 7th ed. Upper Saddle River, NJ: Pearson Prentice Hall. ISBN 0130278246. Walters, Charles. 2003. Eco-farm: An Acres U.S.A. Primer. Austin, TX: Acres U.S.A. ISBN 0911311742. The International Fertilizer Industry Association. This page was last modified on 6 April 2017, at 16:18.